A guy asked me about v400 this week. v400 had CM-13 official builds, but no CM-14.1, although its source is still in CyanogenMod’s Github repo. The problem is that no maintainer has this device to test changes and maintain official builds. So, I got its source tree and built it! Saulo, the guy who asked me about it tested and told me it is working. The build is in the link below. WARNING: This is what I call a blind build (I don’t have the device to test). I can keep monthly builds for this, just to help v400 owners. I’ll create a section for this device here. If you want to know how to onstall this build, check CyanogenMod’s wiki. ‹ v490 has joined the party! Wow now something good is coming. By the way, I’m this guy. 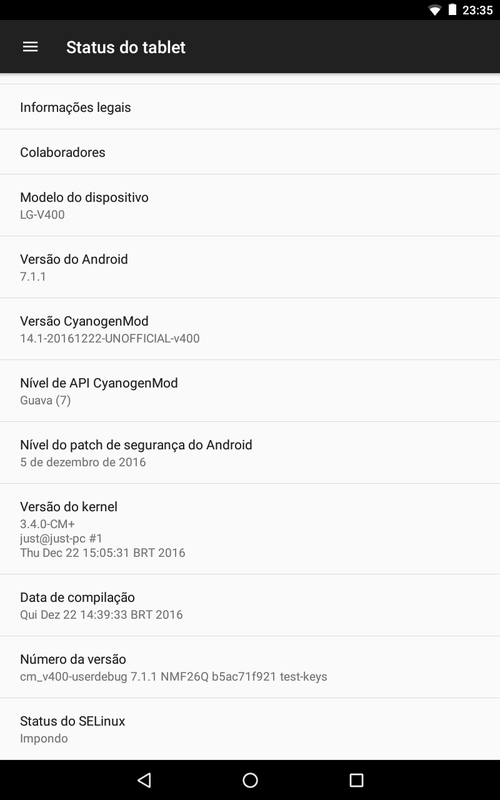 Thank you very much for supporting this device, I was looking forward for some CM14 builds!! I’d love to see future build if it’s not too much trouble for you. Thanks! Hi This is rom not root only adb Please check bro Thank you. What I meant is although invisiblek has ported CM/Laos to v400, he doesn’t have the device to test changes, so that’s why there is no official build for it. You could ask to be the official maintainer of v400 and re-enable official builds. Ill do so once I fix the camcorder. The issue is that v410 and v400 have different camera capabilities and v400 cannot use v410’s res etc. What happens when you try to record? It just crashes or you get an error message? Could you please integrate this short patch into the ALSA usb-sound driver? This would allow for the use of USB 2.0 audio interfaces such as the RME babyface on the v400 – the patch has been upstream in the kernel for a lot of years; the ALSA versions shipped on most android devices are woefully out of date. Hi. I can’t merge this patch because I can’t test it (I need to have such a device to check if everything works fine). But you can tell me what device you have and I can make a build with this patch for you (but it won’t go official). When will the new ROM? You mean a new build for v400? I’ll be doing it this week.